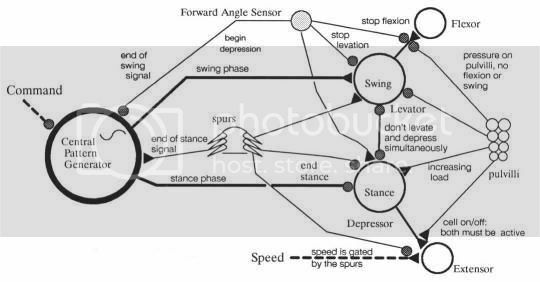 Back in June of 1990, I published a paper called Hexapod Gait Control by a Neural Network at the International Joint Conference on Neural Networks in San Diego. A few months later, a similar paper by Michael McKenna and David Zeltzer appeared in the Siggraph proceedings. Our papers differed in that the McKenna and Zeltzer paper relied on a central pattern generator, and a simple stepping reflex from the literature, whereas my paper showed that no central pattern generator is necessary, and that all observable insect stepping patterns emerge from the interaction of the physical system with the stepping reflex circuit I derived from the experimental literature. Another key difference was that the circuit and simulation in my paper was inherently stable and self-calibrating, whereas the one in McKenna and Zeltzer required hand-tuning of connection values for every preprogrammed gait. Even today the search for central pattern generators continues, and I still believe now as I did then that researchers looking for a CPG are chasing a ghost. I want to thank McKenna and Zeltzer for the inspiration their presentation gave me to continue my work, and Randall Beer, for the encouragement he gave me during the course of my research, and Dave Cliff for laying the groundwork for computational neuroethology with his Provisional Manifesto which forms the basis for my work on Insect AI.